Yoga is a mind-body practice that helps improve well-being on all levels: physical, mental, emotional, spiritual. Yoga classes include physical exercises (Asana), breathing exercises (Pranayama), meditation, and relaxation. These gentle yoga classes are beginner-friendly, no previous experience is required. The benefits of practicing yoga regularly include improved immune system, more strength, greater stamina, better flexibility and balance, concentration, awareness and peaceful mind. Please inform the instructor if you have any medical conditions or serious injury. Intermediate yoga classes are both energizing and relaxing. They offer a combination of tension release, flexibility, stamina, strength, flexibility, and relaxation. These classes are suitable for people who have done yoga for some time and want to move on to the next level of practice, more challenging yoga exercises and longer meditations. Some classes are faster paced and include yoga sequences, which are not appropriate for pregnant women or people with serious injury. High Intensity Interval Training (HIIT) workouts are bursts of intense activity broken up by short rest periods. 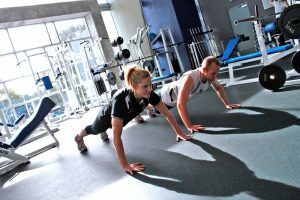 Your workout will be quick and efficient, using only your body weight or additional light weights as resistance. HIIT burns more fat than steady-state cardio, even after your workout is over. You will improve muscular endurance and strength, increase aerobic capacity and feel a great sense of accomplishment … which will make you keep coming back for more!